After we published a letter in last week’s Melton Times from Melton and Rutland MP, Sir Alan Duncan, in which he hit back at criticism of both himself and the police following a rise in criminal activity across the borough, it prompted a deluge of responses via email, letter and social media. In his letter, Sir Alan defended the efforts of Melton’s police officers and was angry about some of the abuse levelled at him online by residents who feel he should have attended a recent public meeting on crime and done more to deal with the rash of burglaries, thefts and arson attacks in the town. This week we spoke in depth to our MP about some of the issues which have been raised by readers about the work he does in the consituency. Melton Times: Some people have criticised you for not being seen in Melton very often Sir Alan. Can you outline how much time you spend in your Melton and Rutland constituency on a weekly basis and how much time your role as Minister of State at the Foreign and Commonwealth Office dictates that you are either at Westminster or abroad on official business? 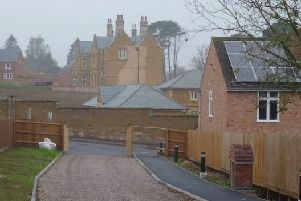 Sir Alan Duncan: Rutland and Melton is one of the largest constituencies in Parliament and contains Melton, Oakham, Uppingham, and over 100 villages. It includes all of Melton Borough, all of Rutland, and parts of Harborough. I am here almost every Friday to Sunday and for much of any recess. I have to be based in Westminster from Monday to Thursday most weeks. As a Foreign Minister I have to travel frequently to represent the UK abroad. I am responsible for 77 countries, covering North and South America, Europe, Russia and Turkey. MT: Could you outline exactly what your role is as constituency MP for Melton and Rutland and what your responsibilities are. Could you also explain how your work complements the roles of Melton borough councillors and our representatives on the county council? AD: My main responsibility as an MP is in Parliament – we make laws, we scrutinise the Government, the winning Party forms the Government and some of us serve as ministers, but you need to know your constituency in order to know what matters to people who live there. We do not, however, have any management authority over the council, the NHS, the planning decisions, schools, or the police. We work by intervening on behalf of people to help solve their problems. We are representatives, we are not delegates, which means that we cannot be instructed how to vote on anything. The councils are run by elected councillors, the NHS by its managers etc, and the police are run by an elected Police and Crime Commissioner, currently Willy Bach, who won it for Labour. MT: How do you decide which issues to campaign on in the Melton borough and what do you believe are the most pressing issues currently facing the area? AD: Much of the work of an MP is kept private, because you are sorting out someone’s personal problems: benefits, pensions, planning, and so on. The most significant campaign for Melton over the last few years has been to get a by-pass. We have succeeded, and secured the necessary funding from the Government. Construction will start next year. There is a growing problem with drugs in Melton, and obviously the recent increase in crime is indeed a top issue. That’s why I have a regular dialogue with the police, and always have done, and it’s why I was out with the police the day after the recent public meeting. MT: Do you have regular surgeries in Melton where residents can discuss their concerns about certain issues and what other ways can people use to get in touch if there is something they would like you to look into? AD: I have a full-time, fully-staffed office in Melton, which serves the entire constituency. I also have a full-time office in Parliament. The location is bang in the centre of town, and anyone with a problem can just walk in. Because this is such a well-designed system it means that we can get things done quickly and can often solve a problem without the constituent actually waiting for a face-to-face meeting. If it is essential to meet personally then we do so in the Melton office. What matters most is that problems get dealt with effectively. Constituents can write to me (33 High Street, Melton Mowbray, Leicestershire LE13 0TR), email me at alan.duncan.mp@parliament.uk or telephone the Melton office on 01664 411211. MT: You were very vocal with your letter in last week’s Melton Times regarding the online abuse being directed at both you and the police following the recent crime increase in the Melton area. What kind of public feedback have you had in response to your letter and what do you hope your strongly-worded comments will achieve in terms of the debate on crime locally? AD: I will always strongly defend public servants, be they police officers, social workers, council officials – or anybody else – if I think they are being abused or insulted. My letter has prompted a very supportive reaction from a number of people who were appalled by the rudeness at the crime meeting, and the amount of unacceptable vulgarity on social media. The police have already arrested a number of people, and at least two who have committed multiple burglaries will be returning to prison. It would be better if some of those who have been so vocal were less aggressive and occasionally said thank you to the police. It is also important that people are careful about what they say on social media and do not spread misinformation. It is only by working together that we can ensure those responsible for crimes can be brought to justice. MT: There was some criticism of you at the recent public meeting with the police because you did not attend. Can you explain why you couldn’t be there that night and highlight what came out of your subsequent discussions with senior Melton police officers? AD: I was never invited to the public meeting. Nobody ever emailed an invitation, sent a letter, or dropped by the Melton office about it. Posting something on Twitter or Facebook does not count as contacting your MP and in fact my Twitter account clearly states, ‘For constituency matters, please email alan.duncan.mp@parliament.uk’. But because I know what is going on in Melton I knew the meeting was taking place, so I sent a statement to be read out. Parliament sits on a Thursday. It’s where I have to be as the MP, so I couldn’t also be in Melton. In the last few weeks I have had discussions with Melton police on many issues, including burglaries on local businesses, arson attacks, reports of a gun being shot, a stabbing, and an assault. I know many constituents are concerned about burglary and theft – the police have told me the vast majority of offenders are funding class A drug habits and they have made a number of successful arrests in dealing with this group of offenders. On the arson attacks on cars, the police believe the recent incident is linked to other car arsons on the Fairmead estate and are urging anyone with information to come forward. I am due to speak to Inspector Siobhan Gorman later this week to discuss these cases in more detail. MT: When you were first elected to the Melton seat in 1992 the police would have had considerably more resources to fight crime with. How challenging do you think their job is now and do you believe they should be provided with more officers, particularly when they have a large rural area to patrol? AD: Of course policing has become more challenging. So have many other areas of public service. Although we are lucky compared with most, Melton does have its share of drug abuse, domestic violence, and burglary. The police have to prioritise. Obviously a murder or a terrorist threat is more urgent, but no level of criminality should ever be ignored. The police have certainly not ignored what has been happening in Melton, and any anger should be directed at the criminals, not anybody else. MT: Can you highlight your biggest achievements for the Melton and Rutland constituency over the 27 years you have been MP and do you feel you have adequately represented the interests of constituents in that time, or are you frustrated that you couldn’t do more in certain areas? AD: My Melton and London offices have a very good reputation for getting things done for local people. They are always receiving thank you letters from people who say that their problem was fixed rapidly and attentively by my staff. I have assisted my councils with important local issues on numerous occasions, and the biggest recent success has been to get Melton its bypass. MT: A number of people have commented on social media that they have tried to contact you and not received a reply. Can you confirm if you do read all your correspondence, and whether you are able to reply to all of it? AD: All MPs face this accusation, even when it’s often not true. I probably receive about 500 emails a week. The auto-reply makes it clear how to contact me and my office, and says how to make contact if for any reason we haven’t replied. But we try to respond to all of them promptly. Some people don’t put their address and contact details on, some are abusive and so are best ignored, and some inexplicably go into the junk folder. It is a sad reflection on modern life and honesty, especially on social media, that an MP can be verbally attacked in public for supposedly not replying to 150 emails from the same person when our inbox doesn’t appear to have received even one of them.